While classic summer weddings tend to get all the attention, fall weddings can be just as beautiful and memorable. There are just as many colors and styles that can work for a fall wedding as there are for a summer or spring walk down the aisle. There are many colorful and creative crafts you make yourself to add a personalized touch to any fall wedding. Nothing says fall like candles. You have a wide selection of choices to get started. If you’re going to go with scented candles, avoid fragrances that will overwhelm a room. Candles should be accents, not the answer to “what’s that smell?” Choose a scent that is subtle, but echoes the typical aromas of fall such as cinnamon and apple. Consider searching local yard sales and thrift stores to find unique candle holders. You can make the candles, if you have the time – but a trip to Walmart will do the trick. Another idea for candle holders is to use jelly jars or other similar containers to create a unique look. For an added touch, wrap the candles with vine or string. A ribbon will also work well. Tie it in a bow to make it a little fancier. 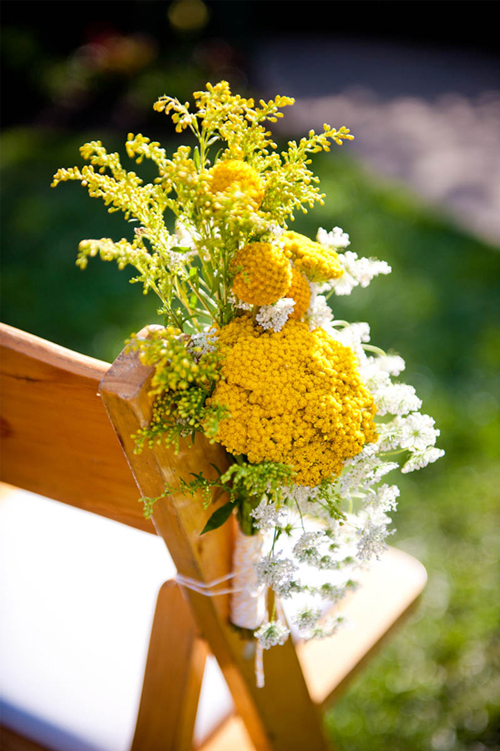 Chair bouquets are a creative way to save seats at a fall wedding. Gather up some favorite fall flowers and wrap them up with a bow or ribbon. Add name tags to each chair bouquet as a clever way to save people’s seats. Add some wheat and a single rose to create a classy bouquet. The bouquets can be tied to the corner or arm of each chair, especially if it’s an outdoor wedding. For indoor weddings, you can get away with resting the bouquets on each chair, which also helps with making last minute seating changes. Don’t be afraid to add a few twigs or branches with the bouquet to further embrace all things fall. This is just the icing on the cake when it comes to fall wedding crafts. Speaking of cake, why not add some fresh cranberries or apples as garnish for the wedding cake? With a little creatively, a fall wedding can be a colorful and beautiful event that everyone involved – from the bride and groom to the guests and the ushers – will remember. Rebecca Brown is an avid blogger for NQ Mobile on Reuters, keeping people protected when using their mobile devices.